I’m not ashamed to admit that I’m a life-long lover of trains. Not so much in the ‘notebook at the end of the platform’ kind of way. Far from it, in fact. But there’s something undeniably liberating about walking into a station and jumping on a train to cross hundreds, if not thousands of kilometres while remaining firmly on the ground. While flying is fast, convenient and increasingly cheap, it is also somewhat of a social barrier in as far as you simply pass over countries rather than through them. Train travel, for me at least, offers the opposite: engagement, integration and a taste of ordinary life in whichever country you happen to find yourself. In a nutshell, the central highlands of Sri Lanka are amongst the most stunning scenery you can ask to experience. 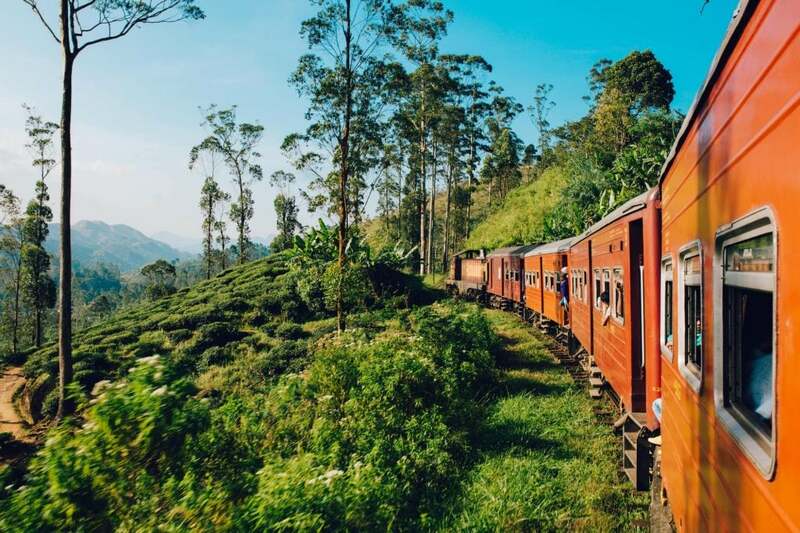 Throw into the mix a historic railway which carves it’s way gently through tea plantations, across stunning viaducts and between towering peaks, and you have a railway journey like no other. Where does the train start and end? The route in question runs between Colombo’s Fort station and Badulla, via Kandy and Haputale. 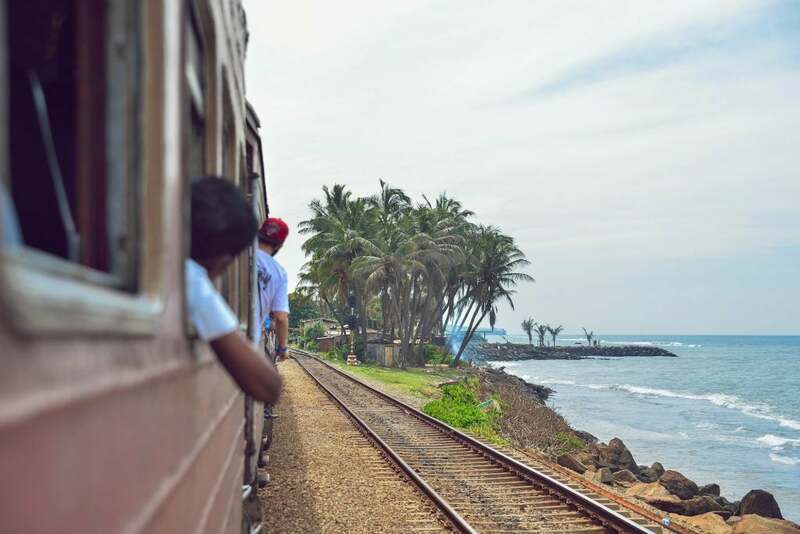 While you can join or leave the train at any of the dozens of stations along the route, most visitors opt to join the train at Kandy and leave it again at Ella. This is generally considered to be the most scenic section and conveniently links two important destinations on most visitor’s itineraries! 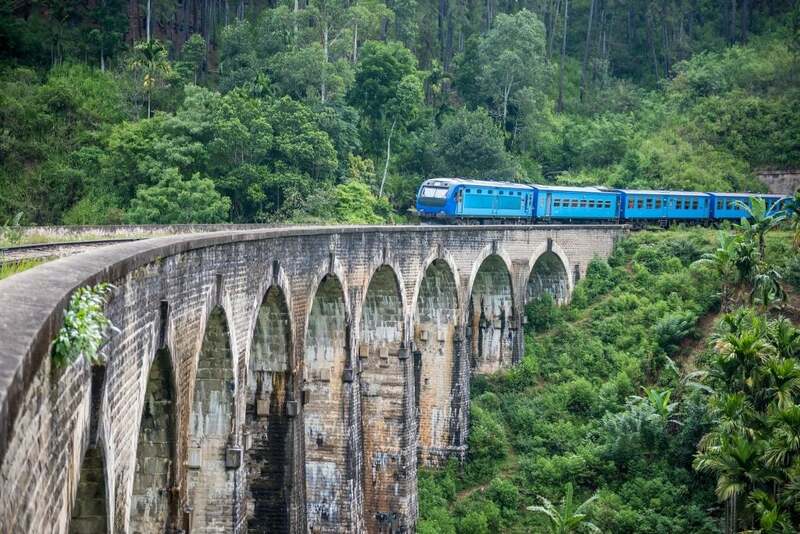 Three trains per day in each direction run all the way from Colombo to Badulla, with an extra early morning service linking Kandy and Badulla. The entire trip takes around 10 hours, although the section from Kandy to Ella generally lasts about 6.5 hours – although be prepared for delays! While not exactly luxurious, Sri Lankan trains are perfectly functional. The route in question uses a mixture of modern, Chinese-built ‘blue trains’ as well as older trains, similar to those found throughout India. Certain departures also feature privately-operated cars aimed at tourists, which include extra touches such as in-seat refreshments and (more) reliable AC, but these typically aren’t worth the significantly inflated prices. Which class should I travel in? Now this is the big question and, to be honest, there’s no right answer. Third class is basic and usually crowded, but incredibly cheap and a wonderful chance to interact with local Sri Lankans. Second Class carriages offer wider seats, some with tables, and are often less crowded making this an excellent option for budget-conscious travellers. Both 2nd and 3rd class are non-AC, although the doors and windows will be open for the duration of the journey making these cars ideal of photographers wanting unobstructed shots! Some trains offer a limited number of reserved seats in 2nd and 3rd class, so be sure to ask at the station! First class is generally limited to one carriage per train and offers reserved seating and some pretty powerful AC, making this arguably the most comfortable way to travel. The downside of AC, of course, is that doors and windows remain firmly closed throughout the journey, leaving you to enjoy the view through some often-pretty-dirty windows! The one exception to this is the aptly named ‘Observation Car’ which is attached to the end of some trains and offers panoramic views back along the tracks. Fares are fantastically cheap, with 3rd class tickets between Kandy and Ella costing in the region of $0.75! So cheap, in fact, that this shouldn’t even be a consideration! Again, this depends on which class you intend to travel in. First class seats are reserved and limited in number, meaning they can and do sell out well in advance. On the other hand, unreserved second- and third-class tickets can’t actually ‘sell out’, although you are by no means guaranteed a seat! A number of agents offer advance booking from outside of Sri Lanka. Personally, I favour 12go.asia for their easy-to-use online portal and secure payment options. Alternatively, if you’re already in Colombo, tickets should be purchased in person at Fort Station, rather than through agents or touts, who often prey on unsuspecting tourists. Simply head to counter 17 to book tickets for reserved cars, or counters 2 or 8 for unreserved 2nd or 3rd class tickets. Ultimately – Is it worth it? Yes. In a way. 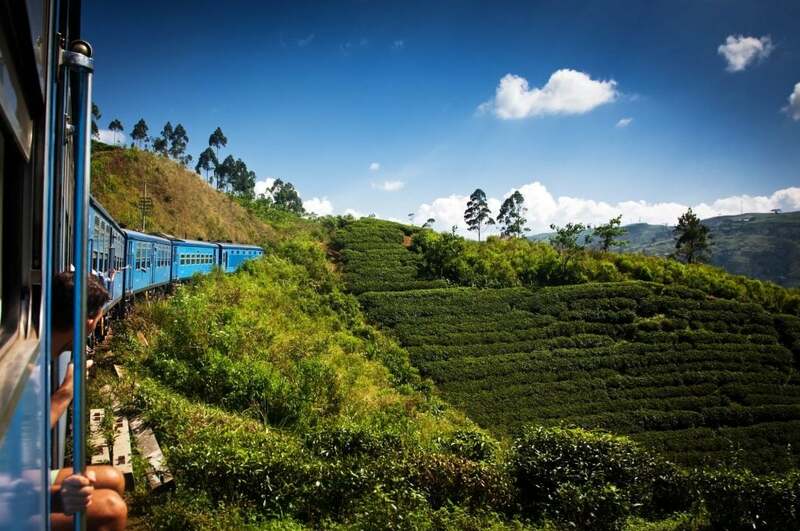 As with so many ‘Great Railway Journeys’, the Kandy to Ella route has become a victim of its own popularity. Yes, the scenery is spectacular. Yes, it’s a great experience. But it is also hot, crowded and notoriously hard to get a seat unless you book months in advance – literally! What that means, is that while you may be travelling through some of the most spectacular scenery imaginable, there’s also a very good chance you won’t get to see too much of it. Remember, the train doesn’t own the rights to the landscape. No matter how you get between Kandy and Ella, you’ll be travelling through the same landscapes and past the same sights. You could even argue that the train limits what you can experience, and there are limited opportunities to break the journey or simply to stop and enjoy your surroundings. So while this is undoubtedly one of the world’s great train journeys, I much preferred driving myself through the mountains in a TukTuk – guaranteed seats, unobstructed views, unlimited stop-offs and one hell of a ride! If you can’t resist and really want to take the train, TukTuk Rental offers a service to transfer your tuktuk while you enjoy the train journey. Charges for this are $50 excl. petrol. Local people from the area are used so that they can earn a bit of extra money on the side as well. Hello! What about from Nuwara Eliya to Ella? How long does it take by train? Do you have have the service to transfer the tuk Tuk from Nuwara Eliya to Ella? And much does it cost? Hi Nuria! Nuwara Eliya to Ella takes about 3 hours. Here we also offer the train transfer service for $50. Another option is to take the train there, then the next one back. Do the journey twice! Thanks a lot for your advice, Weitse! Considering the different options! Yes, that would be an option..but maybe 6h (3h + 3h) by train is too much..Also considering the rute from Ella to Haputale which is only 1h if I am right (then 1h going and 1h back).